Well its happened as they planned it. An awkward little hug diverts attention from their really BIG controversies… of course there is nothing THERE IS NOTHING spontaneous in the great MILAN of the Khans. 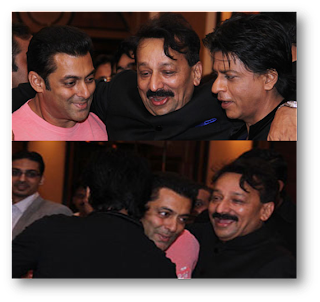 Shah Rukh Khan and Salman Khan hugging each other at Baba Siddiqui’s party after 5 years is definitely the photo op of the decade! But the event was orchestrated to a T. The two Khan’s entered the party almost at the same time(which itself is NOT happening unless totally planned by the army of overpaid PR machinery they are surrounded by!!). Salman’s Dad Salim Khan holds a long conversation with Shah Rukh and Sohail is all over him. And then Salman moves up seemingly spontaneously and the warring khans hug awkwardly, like they have been trained to do. Of course it’s the biggest PLANNED event of the decade!! After all what better than to give the media a bigger tamasha to talk about. Shah Rukh Khan wanted to divert the attention from Ibram Khan his surrogate son and Salman Khan has his own issues of Hit and Run to deal with. This staged spectacle is the biggest con on the increasingly invasive media. And Hello the two madams who they fought over, well one is a yummy mummy and the other is safely enconsed in the arms of another, so it must seem damn stupid to fight when the reasons are gone. And hey if a little hug takes care of the BIG controversies …. As we said….